Well, I tend to call cyclists "boongs"..it's the noise they make as the hit the bars. And yes, in urban areas we do have to reduce the travelling speed to the posted speed limit, or risk a speeding fine. Luckily, most pedestrians do think twice about stepping out in front of such a moving vehicle, or have to suffer the consequences. Sadly wildlife, don't seem to make that "think twice" decision. 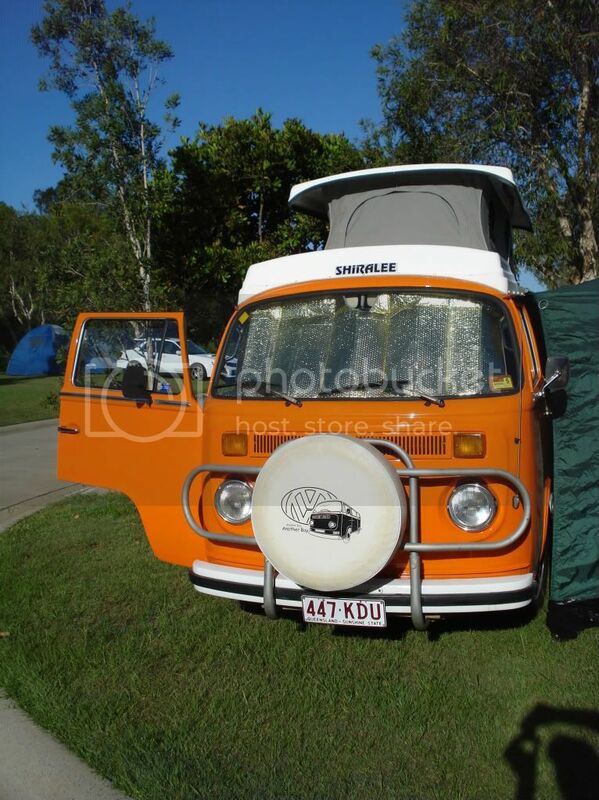 The moulds for the John Terry "Kombi Camper" from the 70's and also marketed as "Discoverer" are owned by a company called NoseCone Australia at Guildford NSW. They have the T3 and T4 moulds as well as the T5 and sell direct to DIY and restorers/enthusiasts.The T3 has been refurbished and now has a straight roof line with no "slump" in the middle. Thought this may help. It then begs the question as to how human pedestrians, cyclists and wildlife are protected from frontal impacts with these lethal projections!?! Are vehicles equipped in this way, prohibited from urban areas or subject to much lower statutory speed limits? Just ban stupid pedestrians - solves multilple issues then. hi guys , does anyone have any info about shiralee conversions i own a 1973 bay . Shiralee did the roof in my van - T3 - they did the standing room extra tall for me and the canvas is a nice dark grey - great for keeping out those pesky caravan park lights !!! I did the interior myself as I had my own ideas as to how a camper should be laid out. There'll be some interior pics when I put her in the "for sale" section in a week or so. This is our 1968 low light Dormobile camper conversion. not sure but believe origional PVC canopy(fern pattern) and interior just recovered and relaminated, part of benchtop was the icebox lid. found sink under benchtop 2 days after purchase by accident. Hey - very nice bus you have there Meggsie. I understand that Dormobiles were made here in Oz from imported moulds and we have a plain type canvas as opposed to the British striped version. That is a very rare and healthy looking bus. Seeing your on the Central Coast, you will have to come along to our next meet - probably the Nationals cruise and show off your bus! Thanks for that, would love to come to the next meet, where r the nationals, we r planing on going to Old Bar, trying to book at Lanis. are you guys going. Old Bar is now a must do every year - although it is a long weekend so bring your wet weather gear! The Nationals is in south western Sydney and is a great event with loads of great VW's and it is always funb to cruise down together. We usually do an early start and meet @ Kariong just after the Shell servo. Hopefully catch you there. Keep an eye out in the "Coming Events" Section. Ha! funny u should mention long weekend and wet weather, just came home from easter camping at Manning Point (out from Old Bar) rained on and off, when will we learn!. 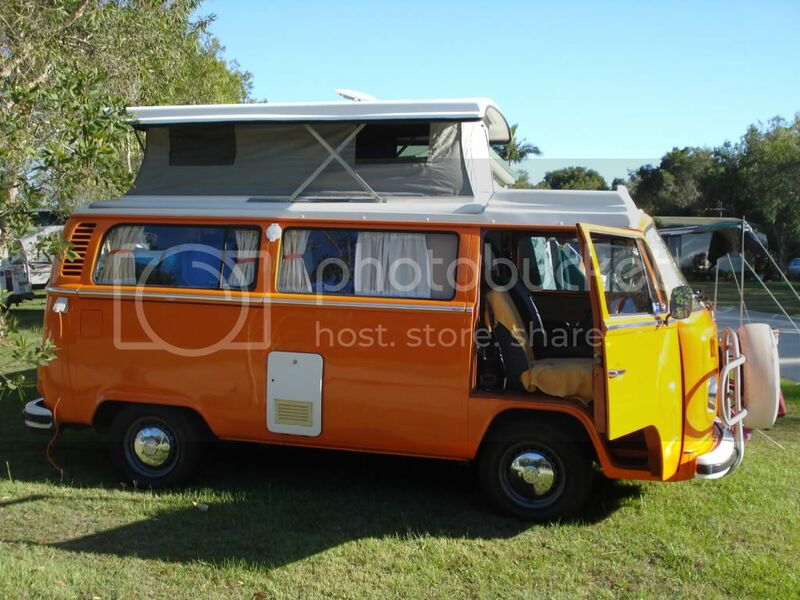 would love to come to the nationals cant wait to see lots of other Kombis and cruise down with u guys, sounds like a plan. Does anyone have a photo of a cupboard that swings out from behind the passenger seat side that enables you to cook while standing outside your van. If you have, do you have photos of how the whole thing works. 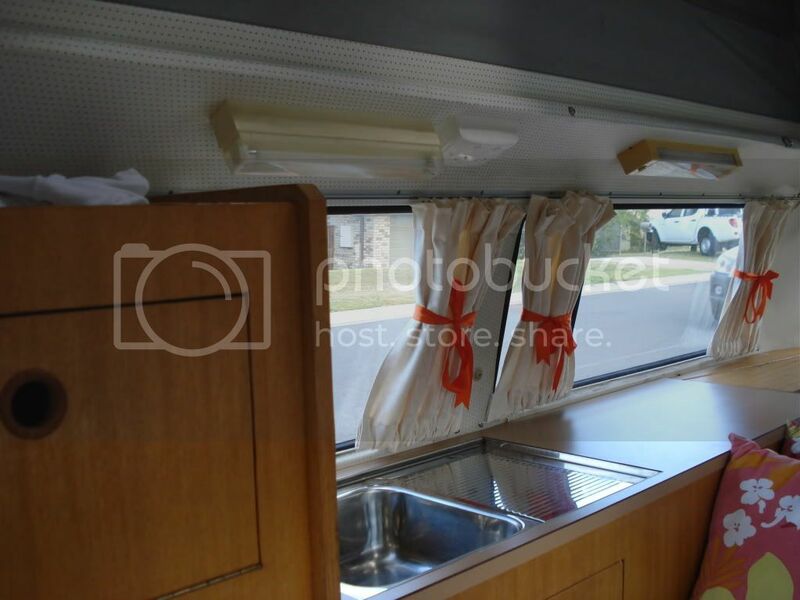 This configuration, seems reminiscent of some of the British Devon and Australian Trakker campervan conversions. Our recently acquired '76 Camper came with the original "Volkswagen Campmobile Instruction Booklet" which explains all the features of the "Adventure" (Basic, Traveller and Deluxe packages) and the hard top "Wanderer." A quite amusing read complete with photos of the features and cartoon-like pictures of native Aussie animals eg: a kangaroo lying under a blanket with his head on a pillow, on the page explaining the upper bed. OH!!! And also has a paragraph or two right at the end (pg 23 if anyone else has the same manual) suggesting that "These days, wherever you drive you are almost sure to see other "Campmobiles" on the move...When on the road give them a wave, or if you share the same campsite say a friendly "hello." " and so on. You need to scan a coulple of pages and put them up! It might also make an interesting feature in Transporter Talk magazine! I shall have to consult with Carol Jarvis, Transporter Talk Editor, but in general, high-resolution scans in either JPEG or TIF formats, attached to an e-mail, are said to be the preferred options. Snail mail, from Australia to Great Britain, could be very expensive! As a guide, how many pages of what page size, are there in the Campmobile manual? I am still trying to sort out with Carol, various other article contributions, from around the World, but she is so busy with her family, full-time job and other Club commitments, it is sometimes difficult to pin her down. Hence, I try to sort out most of the details and alternative options first and then submit them for final approval.